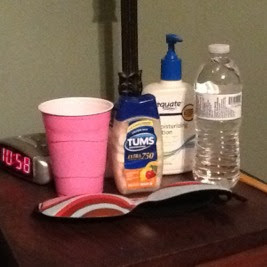 Then tonight I walked in and there was the alarm clock, old age moisturizing cream, Bottled water, a glass of milk and a bottle of Tums. Add that to the wobbling I'm sporting right now and I am OLD!!!!! The only problem is I'm not old! Tonight was a late INSANITY workout but a good one. It was definitely better than the last one where I DID NOT CRY! Don't get me wrong it did hurt pretty bad but it was amazing. I had sweat dripping off my nose. It was a little warmer than normal but I still think the sweat was earned. I was really trying to push it harder than the night before. Now I am finally home, I have my breakfast and lunch packed for tomorrow, my workout clothes are laid out and my work clothes are packed up and in the car. INSANITY....I'll be back in 7 hours. Please Mr. Sandman be good to me tonight.